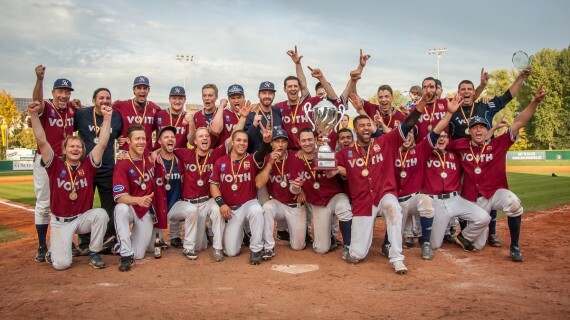 The Heidenheim Heidekoepfe have won their second championship in the German Baseball-Bundesliga. On Saturday they edged out the Buchbinder Legionaere Regensburg 8-7 in front of a full house attendance of 2,500 at the Armin-Wolf-Arena. It was an epic showdown in game five. Heidenheim had the better start and took a 1-0 lead in the second. Peter Sikaras was dealing and keeping the strong bats of Regensburg short. In the top of the seventh it looked like as if the Heidekoepfe run away, as they scored three runs to raise their advantage to 4-0. However the Buchbinder Legionaere offense woke up in the bottom half of the frame. After a couple of runs cut the deficit to 2-4, Philipp Howard stepped to the plate and turned the score around with a three-run home run. It was a short 5-4 lead for the host, as Simon Guehring tied it up again in the top of the eighth with a solo shot. In the bottom of the eighth Regensburg struck again and went up 7-5. Chris Zirzlmeier and Nino Sacasa (4-4) scored on a bunt play. It was not enough, as Heidenheim had the final answer. RBI singles by Guehring and Sascha Lutz in the top of the ninth made it 7-7. Lutz then scored on a single by Aaron Dunsmore for the winning run. In the bottom of the ninth Luke Sommer closed it out for the win. Sommer, who flew in from the United States for the decisive fifth game, picked up the win in relief. Sikaras had issued nine hits, five runs and two walks in 6 1/3 innings. Mike Bolsenbroek had conceded four hits, four runs (3 ER) and four base on balls in 6 2/3 innings. Gianny Fracchiolla took the loss. During the medal ceremony Guehring was named MVP of the final series. Sikaras got awarded as best pitcher, Ludwig Glaser as best batter. It’s the second title for the Heidekoepfe after 2009. Regensburg lost its first final series since 2007, when the Mainz Athletics beat them on October 3 erasing a 0-2 deficit in the best-of-five finals. The Buchbinder Legionaere last won the championship in 2013.